Bank of America Building: A New Green Standard? In the palm of my hand is a near paper-thin, rectangular glass tile with a mirror finish. It's wired to an electric switch. Flick it on and the glass instantly lights up, emitting a warm, bright glow not unlike sunlight, although it remains cool to the touch. Switch it off and the glow immediately disappears. The wondrous object is an organic light-emitting diode, or OLED, a first cousin of the better-known LED. An embryonic technology  there are only a handful of commercial products available  OLED has the potential to revolutionize the world's $100 billion lighting industry. As the U.S. begins phasing out incandescent lightbulbs in 2012  and Europe bans them altogether  the initial winning replacement technology will probably be superefficient, low-energy LEDs. But like incandescents, LEDs are bulbs, points of light. OLEDs, while low-energy, offer an entirely new form of lighting: a glow that radiates from the surface of superthin materials. "We're used to thinking in terms of light points, but this is diffuse light," says Kristin Knappstein, a business-development manager at Philips Electronics, which sells OLED tiles under the brand name Lumiblade. "That's the disruptive nature of it." With OLEDs, naturalistic light can emanate from entire stretches of walls, ceilings, blinds or pieces of furniture. Another likelihood: transparent OLEDs doubling as windowpanes that let in sunlight by day, then create light by night. How do they work? Organic LEDs, like their inorganic kin, are essentially semiconductors. Ultra-thin layers of carbon-based, small-molecule semiconducting materials are sandwiched between electrodes  one positively charged, the other negatively  and encased in glass to protect them. When an electric charge is applied, the layers light up. 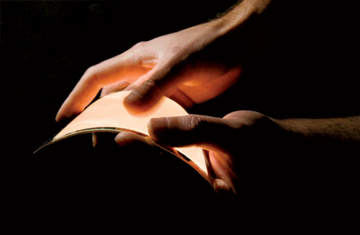 Companies are working on OLEDs encased in bendable plastic that will give the lights another design dimension: flexibility. Welsh company Lomox has patented  and hopes to license  nanotechnologies that do away with the protective layer altogether. Lomox's organic semiconductors are dispersed within chemicals that protect them from the elements, a process that also cuts manufacturing costs. The result is OLEDs that could be painted onto surfaces. "It's like light-emitting wallpaper," says CEO Ken Lacey. Britain's government-funded Carbon Trust recently awarded a $691,000 grant to Lomox to help it develop the technology. The big boys are getting in on the act as well. Philips is one of several European companies racing to bring OLEDs to the mass market  an effort helped by the OLLA project, a successful, multicompany research effort that ran from 2004 to 2008 and received 60% of its $27 million in funding from the European Union. Non-European companies, including the U.S.'s General Electric and Japan's Konica Minolta, are also pouring resources into OLED technology. Many of the big-name manufacturers showed their wares at an OLED design show in London in June. For now, only a few pint-size products  mainly aimed at whetting the appetite of architects  are commercially available. As well as Lumiblades, there's Orbeos, 3-in. (8 cm) square tiles from Germany's Osram (sold under the Sylvania brand in the U.S.), while GE plans to launch some flexible OLED products early next year. Manufacturers say that as production ramps up, increasing the size of OLED panels shouldn't prove difficult. OLEDs are, however, extremely expensive to make. Lumiblade tiles can cost as much as $32 per square inch; Orbeos tiles cost about $370 each. But as with most high-tech products, prices should fall as markets build and mass production kicks in. That could be as soon as 2012, according to Philips. Indeed, market-research firm NanoMarkets estimates the global OLED market will grow from almost nil to more than $4.5 billion by 2013. It helps that OLEDs, like LEDs, are a green technology. Top-quality LEDs use 80% less energy than incandescent lights and can last at least 20 years. That's about two to three times as efficient as current-generation commercial OLEDs, but manufacturers claim that within a few years, OLEDs will match LED efficiencies (and indeed already have done so in labs). There are skeptics. "That sounds overly optimistic. This has been the forecast already for a couple of years," says Dominik Wee, a high-tech-industries expert at consultants McKinsey & Co. But John de Mello, a chemist who researches organic semiconductors at London's Imperial College, says whittling down the cost of OLEDs while increasing their size and efficiency "are absolutely soluble problems. OLEDs are incredibly efficient already and only likely to get better in the foreseeable future. It is a very compelling technology." Hannes Koch, a co-founder of London design studio rAndom International, agrees. Last year his group fashioned 900 Lumiblades into an art installation, a wall of light that interacts with passersby. And Koch now raves about the quality of OLED light. "It is really beautiful, very different from other lighting technologies we've worked with. The fact that the surface is emitting the light is incredible  it was like glimpsing into the future." And if lighting manufacturers are right, that future is quite close at hand.